The Dvorak is less Frenetic than other RPO performances in the 'Treasury' box: which appear to be mastered at very high levels. So good to see that someone else appreciates the quality of the performances and recordings that Reader's Digest taped in the 1960's - I guess the undoubted influence of Charles Gerhardt and Kenneth Wilkinson. They were brilliant at finding unknown lighter pieces. Cut my classical teeth on R/D albums - must have approx 50 of their box sets. The pressings were always superb. I will look forward to hearing your transcriptions, especially the three lighter pieces - why do we not hear them these days? Please - more Reader's Digest uploads. Not sure I like the sound of the Dvorak - and my hands-off approach seems to be revealing too much inherent distortion from the very bright 1963 box (RDS502) - so must now check this via the larger main system - but don't really wish to upload more from that box as digitizing the sound likely does no favours. 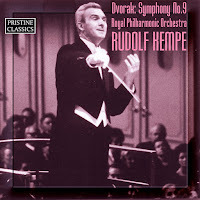 Readers Digest had substantial quantities of 'now forgotten' smaller works - so it would be possible to make some sort of compilation - but there is a 'driven' quality to many of the RD performances that I find offputting (though the 1966 box, below, seems to have a nice Haydn Sym.100 (RPO/Gerhardt) + a good transfer of Schubert Sym.8 (Oslo/Fjeldstadt) - better than those in the 1959 mono box - and his stereo 1960 Camden of Mozart 40/Mendelssohn's Italian. Having dragged the desktop setup to another room./system I can confirm that the Dvorak sounds quite superb as the 24/96 file...and 'more exciting/detailed' than the LP sounds when compared side-by-side! I love these RD uploads. I would humbly suggest doing lots more! Especially the ones never transferred to CD. I knew you'd find one of my blind ("deaf") spots one of these days - who was James Walker? Was he a Gerhardt nom-de-baguette, or did he exist? If my RD boxes weren't currently inaccessible I could probably learn more. Thanks for the Dvorak - Kempe's RPO recordings seem to be overlooked, but I think he got them to play at the top of their form (and I attended many of their concerts together), notwithstanding a persistent rumour, which I have never heard verified, that he was dismissive of them - anybody heard anything about that? He was a Producer - apparently with a sideline in Stick-Waving: see CHARM's Decca discography. There's even a 1962 RPO Scheherazade in the below 1966 box (also a 3LP potted G&S - have that too). Unless there was a problem with my first mastering of the 'Alpine Symphony' on RCA SB then this is much the better recording - though the Dvorak is vastly over-rated (never 'keeps my attention' in the slow mvt..). Surprising about his attitude to the RPO; after all, Beecham invited him in 1960/Chief Conductor from 1961 - and the 1966 RFH Alpine Sym booklet has him as Artistic Director of the Zurich Tonhalle/soon to be of the Munich PO: hardly top ensembles; though recall the RPO was threatened with closure around this time - and the Q.Mum then became the Royal Patron? The threatened closure of one or other of the London orchestras has been a hardy perennial throughout my listening life. My memory tells me that the Royal Philharmonic Society objected to the use of the "Royal" when the RPO ceased to be the usual band for RPS concerts. The problem was neatly solved by conferring a Royal charter on the orchestra. I never cease to be amazed that musical life in Britain carries on at all, given the factional nature. I have been chasing the Schumann 3rd by Leibowitz on RD for some years, any hope for that? Thamks for the nice transfers! The Schumann 3rd was included in RD's "Favourites from the Classics" CD series, Schumann box - a 3-CD set RDCD 3831-3 issued in 2003. As an aside, Leibowitz's Schubert 9 with the RPO is in a similar Schubert box RDCD 861-863 from 1994. I have both. That's OK then; but had considered some stereo Leibowitzii - however the (French) orchestral playing seemed a bit rough as well (inadequate rehearsal time?) and prefer transferring performances that I find 'worthwhile' (artistically/technically) rather than their being semi-obscurities (so that rules-out Leitner/Berlin PO + Swarowsky /Vienna mono Schumann 3rd's on Heliodor/WRC - especially as the recorded sound is inferior in both instances. Mostly I've taken from LP what isn't/hasn't been on CD -which is obviously limiting as they are also pre-1963 recordings. With Readers Digest there appear to be 'CD oversights'- (judging by the 2009 CHARM Decca UK/French discographies: though the non Decca-recorded Italian stuff maybe are mostly not on CD?). CD compilations can be taken from many LP releases -and, in the case of the James Walker items, the remainder were of no real consequence/interest (IMO). In the case of the Kempe/Dvorak, that seemed about the best performance in the 12LP set (which is an audiophile 'must have')- so thought I'd transfer it - but equally could've made the mono CLP Malko/Philharmonia available.. I don't buy CD's - so never compare to those - only, sometimes, with a 'restorers' (sic) transfer from LP/CD -if I happen (...) to do a 'competing' upload...and, now, 24/96 transfers can have a far-greater frequency-range compared to the rather obsolete CD-format.